After German organisations had been dissolved by the Allies in 1947, in 1950 the IOC recognized the reorganized Nationales Olympisches Komitee für Deutschland for all of Germany, based in (West) Germany. Due to the Cold War, an East German state (German Democratic Republic) was created in October 1949, and a separate National Olympic Committee (NOC) for East Germany was established in 1951. 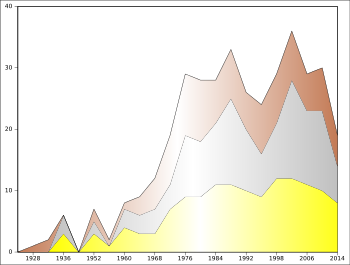 It was not immediately recognized by the IOC, which until 1965 required that athletes of the NOC of East Germany join the German team represented by the West Germany-based NOC of Germany. This team, which competed together from 1956 to 1964, is nowadays called the United Team of Germany (EUA, "Equipe Unifiée Allemande"), but was Germany (GER) then. As a result of the Germany being divided, from 1968 to 1990 two independent teams competed in each of the Games; the original designations were GER for the Federal Republic of Germany (West Germany) and GDR for the German Democratic Republic (East Germany). In 1980 the West German code was changed to FRG (which is currently also applied by the IOC in retrospect). After the GDR ceased to exist in 1990 and its states joined the Federal Republic of Germany, Germany once again was represented by a single team, designated GER. Additionally, in the early 1950s the French-occupied Saar had its own NOC and competed at the 1952 Summer Olympics before joining the German Olympic team in 1956 and the (West) German state by 1957. 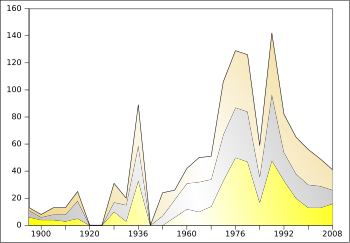 Germany has competed at the Olympics under five different designations, including as two separate teams at several Games. Sources vary in how they present the medals won by these teams. The table below shows sourced combinations of these teams, when applied to the main table. Saar competed independently in the Summer Olympic games in 1952, but failed to win any medals. Due to most lists only listing medal counts, it's possible but not certain Saar was included as part of Germany in their calculations. For the 1972 Summer Olympics in Munich, West Germany, see West Germany at the Olympics. *This table does not include two medals – one gold and one silver – awarded in the figure skating events at the 1908 Summer Olympics. *This table includes two medals – one gold and one silver – awarded in the figure skating events at the 1908 Summer Olympics. ^ Counting the eleven Games where both East Germany (GDR) and West Germany (FRG) competed as two appearances. "Results and Medalists — Germany". Olympic.org. International Olympic Committee. "Germany". Sports-Reference.com. Archived from the original on 2013-05-16.